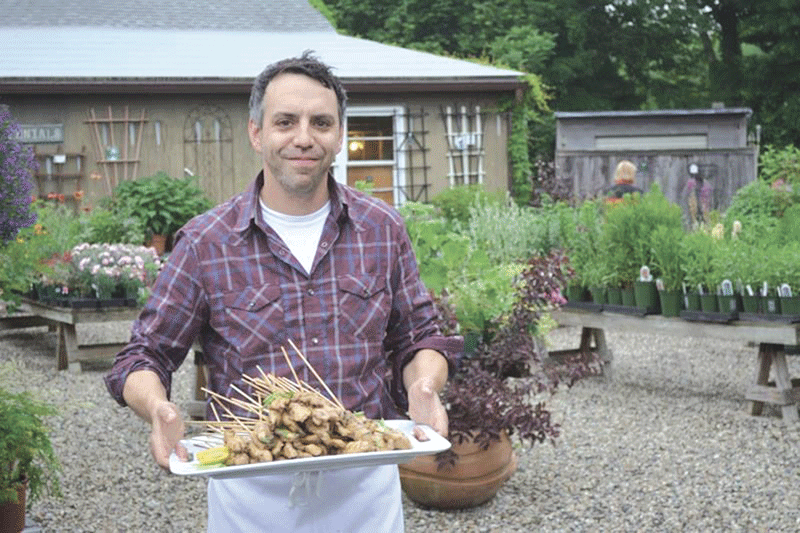 Kevin Sahagian, Mill 1’s catering partner, uses seasonal produce from local farms. Last year, Holyoke Medical Center transformed the event space in Mill 1 at Open Square into a winter wonderland for its annual holiday party. Sparkling Christmas trees stretched toward the exposed beams on the room’s 12-foot ceiling, evergreen boughs nestled in deep windowsills that flank both sides of the room, and birch bark was wrapped around decorative centerpieces on every tabletop. Mill 1 is one of six buildings in Holyoke that make up the complex known as Open Square. It was a former paper mill, and architect and principal John Aubin began revitalizing the 19th-century structures in 2000. Today, they contain office, retail, and light-industrial storage space, as well as the event space he carefully designed five years ago. The impetus to create that area came from a confluence of factors: Pearl Bridal Boutique had opened in 2008 on the first floor, a liquor license was obtained for the café in the spacious first-floor lobby, and Bergin had been receiving frequent calls from people who loved the ambience of the renovated complex and wanted to know if Open Square had space that could be rented for an event. The maple ceilings, beams, and brick walls were sandblasted, and the floors, which date back to 1846 when the mill was built, were refinished. In addition, a modern heating and cooling system was installed, and a partial wall was built toward the back of the space, which draws attention to the area often designated as a dance floor. About 40 events were held there last year, ranging from corporate holiday parties, weddings, and fund-raising events to a lavish, 50th birthday celebration and a bat mitzvah. 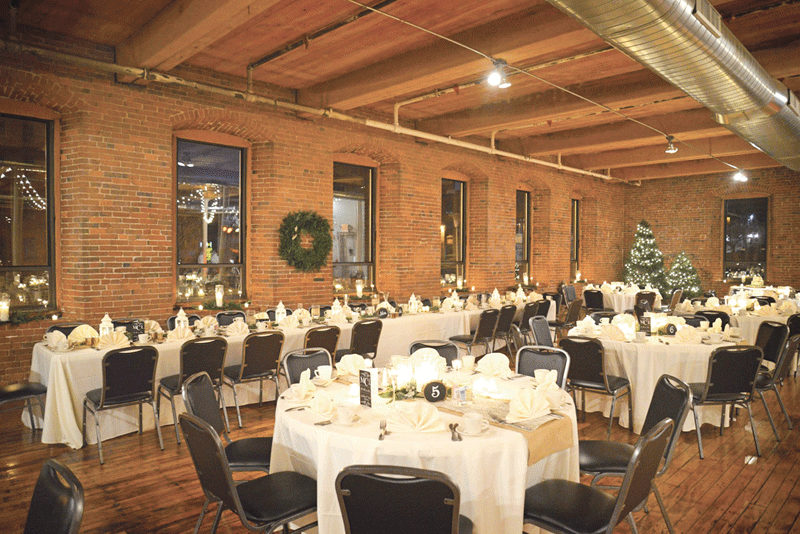 Brick walls and oversized windows provide an ideal setting for a holiday party. The spacious lobby serves as an ideal spot for cocktail hours and a display of large panels titled “Between the Canals: The Evolution of a Mill Town,” created by Enchanted Circle Theater for a production of the same name, adds to the historic feel. “We are also conveniently located — just a short distance from I-91, I-391, and Route 141,” Bergin said, adding that Mill 1 has parking for about 150 vehicles and is handicapped-accessible. When the space first opened, people had to hire their own caterers. “But it was one more thing for them to do, so last year we began looking for a local partner,” Bergin said. They teamed up with Kevin Sahagian, who owns Captain Jack’s Roadside Shack in Easthampton and Electric Café and Catering. He told BusinessWest he takes pride in the fact that he uses ingredients and produce from local farms, and offers a full range of options that includes buffets, formal sit-down dinners, and cocktail hours with hors d’oeuvres. Sahagian said a growing number of businesses are choosing holiday parties centered around food stations, which allow people to mix and mingle as they move from one station to the next. Signature cocktails are also available, including a pomegranate rosemary punch and bloody marys created by partygoers at a bloody mary-cocktail shrimp station. Sahagian explained that guests can make their own cocktail and garnish it with shrimp, or simply enjoy the shrimp and cocktail sauce on its own. “Buffet and plated dinners are always available, and a sample seasonal menu could include a salad of tempura parsnips tossed with mustard greens, creamy gruyere potatoes, port-wine-and-prune-braised brisket, and cider-doughnut bread pudding,” he suggested. In addition to the food, Bergin added, Mill 1 prides itself on the quality of its linens, glassware, and silverware. However, decorating the space is left to the clients. “We host quite a few weddings and during the holiday season, and many people put up Christmas trees as part of their décor,” she said, adding that Mill 1’s website contains a list of preferred vendors for those who don’t want to do their own decorating, or who need services like photographers, florists, live music, and more. Mill 1 has become a popular place to stage annual corporate holiday parties and other gatherings, and clients have included Veritech IT, the Jewish Federation of Springfield, O’Connell Development, and the Greater Holyoke YMCA, which held a fund-raiser in the space. 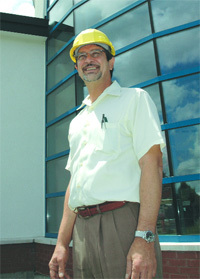 Traditions are created when companies return, but Open Square is a place where the past meets the present, Bergin said. “We are the only private operator left on the canal system generating our own electricity, which powers all of our buildings.